CRS® (Chemical Reducing Solution) is an iron-based amendment for in situ chemical reduction (ISCR) of halogenated hydrocarbon contaminants such as chlorinated ethenes and ethanes. 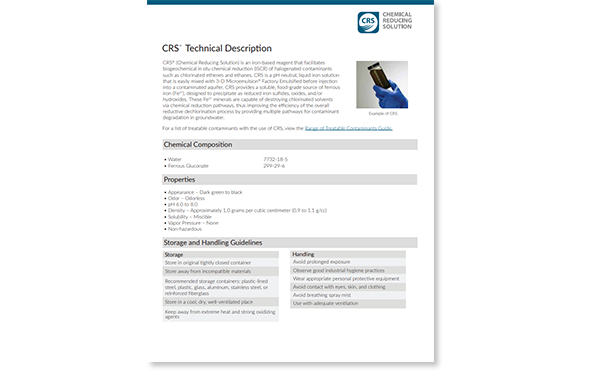 CRS is a pH neutral, liquid iron solution that is easily mixed with 3-D Microemulsion Factory Emulsified before injection into contaminated groundwater. CRS is a soluble, food-grade source of ferrous iron (Fe2+), designed to precipitate reduced iron sulfides, oxides, and/or hydroxides as shown in equation 1. These Fe2+ minerals are capable of destroying chlorinated solvents via chemical reduction pathways, thus improving the efficiency of the overall reductive dechlorination process by providing multiple pathways for contaminant degradation in groundwater. 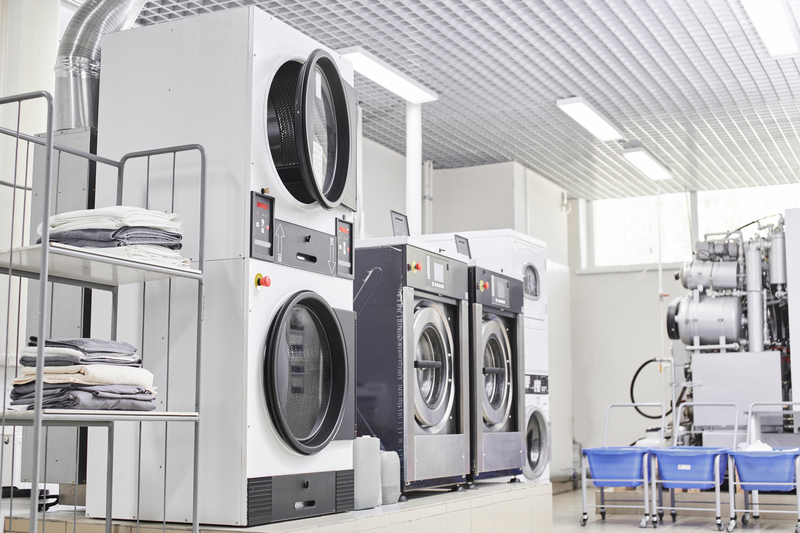 The incorporation of iron as metallic particles or ferrous salts (Fe2+) can enhance chlorinated contaminant remediation by enabling various chemical reduction pathways. The overall combination of biological and chemical processes are referred to as “biogeochemical” reduction of contaminants. Biogeochemical reduction utilizes the biologically-generated reducing environment to create reduced iron precipitates that then go on to chemically reduce chlorinated solvents. 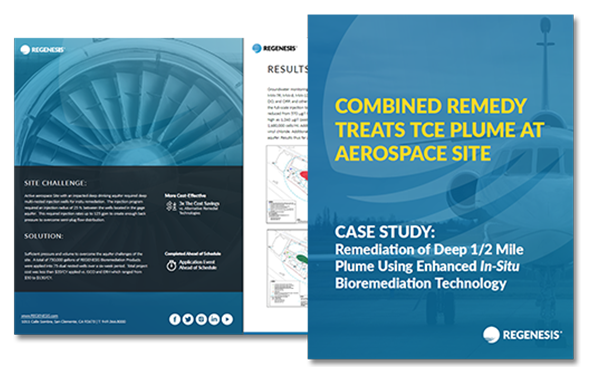 CRS is used in conjunction with 3-D Microemulsion to provide the necessary iron to activate abiotic chemical reduction (including the β-elimination pathway) of chlorinated organic groundwater contaminants like perchloroethene (PCE), trichloroethene (TCE), dichloroethene (DCE), and vinyl chloride (VC). The end products of these biogeochemical reductions are ethene and ethane. What is Chemical Reducing Solution? Chemical Reducing Solution is a liquid iron-based reagent for the enhanced biogeochemical in situ chemical reduction (ISCR) of chlorinated contaminants. CRS is a pH neutral, liquid iron solution that is injected into contaminated groundwater to treat halogenated hydrocarbon contaminants such as chlorinated ethenes and ethanes. How does Chemical Reducing Solution work? CRS is a soluble, food-grade source of ferrous iron (Fe2+), designed to precipitate reduced iron sulfides, oxides, and/or hydroxides. These Fe2+ minerals are capable of destroying chlorinated solvents via chemical reduction pathways, thus improving the efficiency of the overall reductive dechlorination process by providing multiple pathways for contaminant degradation in groundwater. How do I know if Chemical Reducing Solution is right for my project? Chemical Reducing Solution is right for your project if you are treating halogenated hydrocarbon contaminants such as chlorinated ethenes and ethanes and your treatment requires multiple pathways, both abiotic and biotic, for contaminant degradation in groundwater.